The designation employed and the presentation of the material in this information product do not imply the expression of any opinion whatsoever on the part of the Food and Agriculture Organization of the United Nations concerning the legal status of any country, territory, city or area or of its authorities, or concerning the delimitation of its frontiers or boundaries. 1. WHY DO WE NEED THIS GUIDEBOOK? 2. WHAT IS FISHERIES MANAGEMENT? 4. WHO IS THE FISHERY MANAGER? 5. WHAT CONSTITUTES A MANAGEMENT AUTHORITY? 6. GOALS AND OBJECTIVES: WHO NEEDS THEM IN A FISHERY? 9. IS ALL THIS LEGAL? 1. WHAT ARE AREA AND TIME RESTRICTIONS? 2. WHY WOULD YOU ESTABLISH AREA OR TIME RESTRICTIONS? 3. WHAT ARE THE ADVANTAGES AND DISADVANTAGES OF AREA AND TIME RESTRICTIONS? 5. WHAT ARE THE PRACTICAL STEPS TOWARDS ESTABLISHING TIME AND AREA RESTRICTIONS? 2. WHAT ARE INPUT AND OUTPUT CONTROLS? 3. WHY WOULD YOU WANT TO USE EFFORT OR CATCH MANAGEMENT? 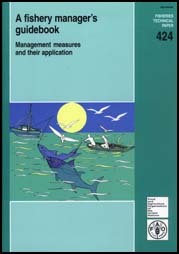 3.1 How do they link with the objectives of fisheries management? 4. HOW WOULD YOU IMPOSE FISHING EFFORT MANAGEMENT AND CATCH MANAGEMENT? 5. WHAT STRUCTURES DO YOU NEED FOR EFFORT AND CATCH MANAGEMENT? 6. WHAT PROBLEMS EXIST WITH THE APPLICATION OF EFFORT MANAGEMENT AND CATCH MANAGEMENT AND HOW MIGHT THEY BE CIRCUMVENTED? 8. WHERE CAN YOU SEE EXAMPLES OF EFFORT MANAGEMENT AND CATCH MANAGEMENT IN ACTION? 2. WHAT DATA AND INFORMATION DO I NEED? 2.1 What information is needed to help make a decision? 2.2 Where do I get the information and how can I use it? 3. HOW MUCH FISH SHOULD BE CAUGHT: HARVESTING STRATEGIES AND REFERENCE POINTS? 4. WHAT TOOLS CAN BE USED TO GENERATE INFORMATION TO ADVISE MANAGEMENT? 5. HOW IS THE INFORMATION USED TO DEVELOP A MANAGEMENT STRATEGY? 5.1 What sort of biological information is needed? 5.2 What sort of ecological information is needed? 5.3 What sort of social and economic information is needed? 7. HOW SHOULD DECISION-MAKERS AND THE PROVIDERS OF INFORMATION WORK TOGETHER? 1. WHAT ARE USE RIGHTS? 2. WHY ARE USE RIGHTS RELEVANT TO FISHERY MANAGEMENT? 3. HOW DO USE RIGHTS RELATE TO OTHER RIGHTS IN FISHERIES? 4. WHAT FORMS OF USE RIGHTS ARE THERE? 5. HOW ARE USE RIGHTS IMPLEMENTED? 5.1 Are use rights already in place? 5.2 What is the best set of use rights? 5.3 What is the underlying policy framework? 1.1 What is monitoring, control and surveillance? 2.1 What should a management plan contain? 2.5 Who should design a management plan? 7. CONCLUSIONS: HOW DOES A MANAGEMENT PLAN HELP TO ACHIEVE THE MANAGEMENT OBJECTIVES OF A FISHERY?